Isn’t it annoying when your drinks are warm? All I ever wanted was an ice cold drink especially on a warmer day. Well now I can no matter where I am thanks to some of these incredible ice chests! I often get the questions – what is the best ice chest on the market? Well when it comes to choosing there are many things that I wanted to consider when deciding the best options, but of course the most important element was having an ice chest that has long ice retention, that was my number one priority. So, after using and testing countless amounts of coolers and ice chests below are my favorite 5 options that are sure to live up to the hype! This pelican cooler is one hell of an ice chest. First off it is available in many different color and sizing options but I personally used the 20-quart version which would be perfect for shorter trips where you don’t need as much space inside. 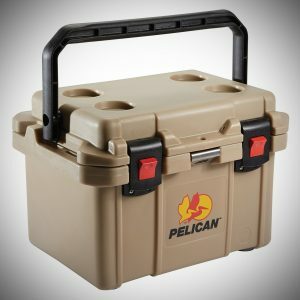 As you probably can tell from the picture this Pelican ice chest is one rugged cooler that is both durable and built to last. Before I talk about the ice retention let me talk about a couple of the quirks with this ice chest. First off, the latches are some of the best I have used, they feel premium and close nicely with a clipping mechanism. If you are going to be using this for storing drinks inside it’s an ideal option because it has 4 bottle holders on the top and a bottle opener built into the front middle of the unit which is very handy. Also, the handle is good, it will be easy to carry even when fully loaded. When it comes to ice retention this cooler is very good especially considering the size. In my experience, it was able to retain ice for 3-4 days even in hot weather of 90+, which is really no surprise considering the material that has been used. It is premium and feels strong which of course helps with insulation. One final thing I would like to mention about this cooler is it has a lifetime warranty included which is always welcomed! 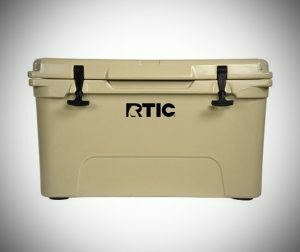 This RTIC cooler is available in 3 different sizes 20 quart, 40 quart and 65 quart. I personally used the 45 option. If you are on the market for a premium ice chest but you don’t want to spend too much on it then this would be a great option for you, it offers most of the things you would expect from a top-notch brand like Yeti but at only a factor of the cost. The cooler itself is made from a roto molded plastic which is very strong and durable and of course greatly helps with insulation. Now ice retention is great after 6 days of usage and in hot temperature of 80+ I could get 6 days of ice retention, also if you are keeping this cooler in a climate that is not as hot it’s going to do wonders for you. People have reported getting 2-3 weeks of ice retention at temperature of 60 which is incredible, definitely its main selling point. 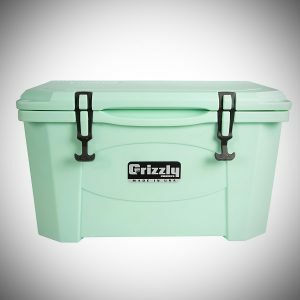 When it comes to offering one of the best amount of size options and a good selection of color options Grizzly cooler are a great option. When it comes to design and style they are one of my personal favorites. The ice retention on this ice chest could retain ice for 6 days in temperatures of 90F which is of course one of the best we have tried. I personally used the 40-quart option, though if you do decide for a smaller size the ice retention will drop a little and if you go for a bigger size it will increase. It’s very sturdy and feels well-built and designed. It in fact has a double wall of roto molded plastic which is one of the reasons for this. The handles of this cooler are comfortable to use even when the ice chest is fully loaded. There are also rubber feet on the bottom side which stop the chest from moving around especially when on a smooth or slippery surface. One final thing to mention about this cooler which may be a selling point for some people is that it has the Bear Proof Certification which means it has been tested and approved so that a bear cannot get inside. 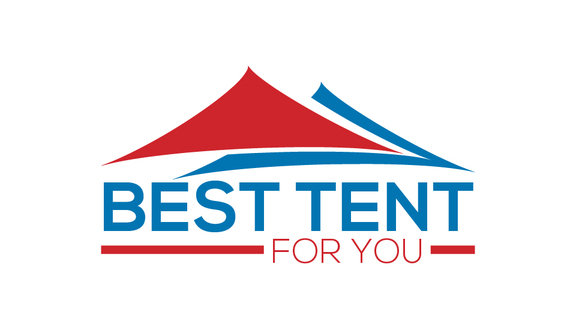 It’s also worth mentioning it has a lifetime warranty not only does that offer a nice piece of mind but it is often an indication of the quality of a product being top notch quality and this is no exception. This is one of the best ice coolers period. Yeti is without a doubt the most recognizable brands when it comes to ice chests and coolers. They are known for being top of line the when it comes to quality and I do have to agree for the most part as their coolers has made the 2nd best on my round up, let me explain why. When you first see and use a Yeti in person you will know it’s a product of superior quality, it’s the Rolls Royce of coolers. The insulation on this ice chest is top notch its pressure injected which basically means it does a fantastic job of keeping the cold inside and the warmth out. This correlates to the ice retention where it can easily go 6-days in hot weather and you will still find ice inside. It also comes with a basket where you can store your dry goods so that they are not in direct contact with the ice which is a nice addition. One thing I would like to address as it is a question that is often asked is – is it easy to carry? I would personally say once you go for the sizes that are over 50 quarts you are going to struggle to carry it solo unless you are strong so that’s something to keep in mind. But it makes up for it in how well it keeps things ice cold! For more Yeti cooler options check out my Yeti Coolers on Sale article. 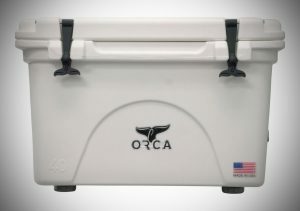 Orca what a cooler! When it comes to having the most amount of size and color options this Orca ice chest is your best option. Its available in sizes from 20 quart all the way up to 140 quart and color options from white to hot pink. You are sure to find the one that meets your needs! 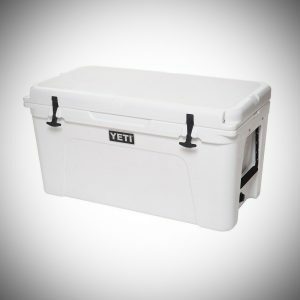 When comparing this cooler to a Yeti it offers the same quality of ice retention of 6-7 days in hot weather all while being lower priced than the Yeti. I personally prefer the slight design difference and features too. It has a section on the backside of this ice chest that can be used for a little additional storage which was perfect for keeping small things like bottle openers which is what I personally used it for. On the bottom side, it has 4 rubber feet which make it perfect if using it on a slippery surface like a boat deck. As you may have guessed the latches work perfectly as intended for creating a perfect seal. All their coolers are made in the USA which is always a good sign, it basically means more quality and consistency when compared with coolers that aren’t made in the United States. It of course includes a lifetime warranty which is no surprise. This is without a doubt the best cooler for the money with the most amount of options and features and durability all at such a competitive price point. 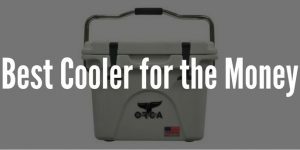 Don’t forget to check out my full Orca Cooler Review for more information of this amazing cooler! 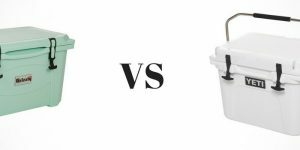 Yeti vs Grizzly - Which is the Best Cooler? 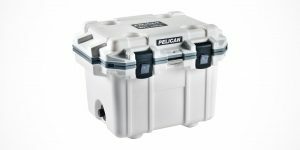 Pelican Coolers for Sale - Are they Worth it?